Hi Scott, yes! Like the Airstream, these evoke such nice childhood memories, don’t they? Have a great Friday :-). Thank you Scott. Thanks Nigel 🙂 I think they got here (like most of us) from your part of the world. aka Queen Anne’s Lace, the purple seeds in the middle are Anne’s blood from a finger prick as she was crocheting…for a long time I thought they were insects! We have these along all the rivers and road sides at the moment, just wonderful. We have so many along the lanes that you have to watch yourself at turns as you cannot see that much. Your photos are such reminders of growing up in OH farmland. 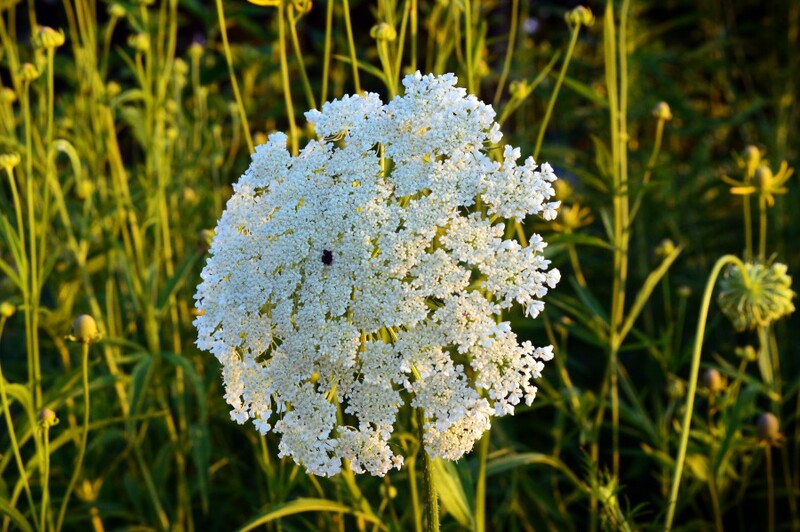 I still love Queen Anne’s lace. Chickory, too! Hi Pam, thank you for such a lovely compliment! I too love chicory – that clear cornflower blue along the roadways is such a pleasure to see. Which reminds me…. hmmm……it just finished blooming, though. Next year! 🙂 Thanks, Pam. It’s in full bloom here!